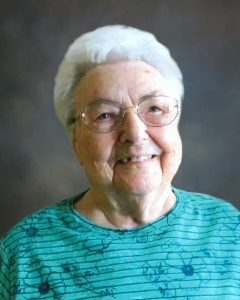 Estella C. Rieke, age 98, of Fairfax, Minnesota, passed away Thursday, April 11, 2019, at Fairfax Community Home. Mass Of Christian Burial will be held on Tuesday, April 23, 2019, at 11:00 A.M. at St. Andrew’s Catholic Church in Fairfax with interment in the church cemetery. Visitation will be held on Monday, April 22, 2019, from 5:00-7:00 P.M. at the church with Prayer Service at 5:00 P.M. Visitation will continue one hour prior to the service at the church on Tuesday. Memorials preferred to American Cancer Society and St. Andrew’s Catholic Church. Estella Cecelia Rieke was born on October 3, 1920, in Fairfax, Minnesota. She was the daughter of Joseph and Susan (Leick) Hartung. Estella was baptized as an infant and was later confirmed in her faith as a youth, both at St. Andrew’s Catholic Church in Fairfax. She received her education at St. Andrew’s Parochial School and Fairfax High School and was a graduate of the Fairfax High School Class of 1938. On February 25, 1945, Estella was united in marriage to Gordon Rieke at St. Andrew’s Catholic Church in Fairfax. This marriage was blessed with six children. After their marriage, the couple farmed in Cairo Township, retiring in 1989. She was a loving wife, mother and grandmother. They shared 65 years of marriage before Gordon passed away on September 20, 2010. Estella was an active member of St. Andrew’s Catholic Church in Fairfax, CCW, Legion of St. Mary and CUF. Estella had many hobbies including quilting/sewing, gardening, camping, fishing, playing cards, dancing and she loved to travel. She cherished the time she spent with her family, especially her grandchildren, great grandchildren, great great grandchildren and friends. Estella passed away on Thursday, April 11, 2019, at Fairfax Community Home, at the age of 98 years. Blessed be her memory. Estella was preceded in death by her Parents, Joseph and Susan Hartung; Husband, Gordon Rieke; Daughter, Barbara Rohde; Sisters, Sister Joseph Marie, Angela Brandel, Mary Ann Wesselman, Margaret Hartung, Crescentia Liebl-Grosam; Brothers, Nicholas Hartung, Joseph Hartung and Aloysius (Philip) Hartung; Great Granddaughter, Kalley Felt. My deepest Sympathy in the loss of your Mother, she was a great lady and always happy when I saw her. Such a talented and lovely lady. Great friend of my family. I always enjoyed Stella, while Donald was a resident at the nursing home, I could drop by Stella’s room , she would cheer me up .. she loved music …front row and she would know the songs when they had entertainment..She lived a long life.. ? I always enjoyed Stella, while Donald was a resident at the nursing home, I could drop by Stella’s room, she would cheer me up .. she loved music …front row and she would know the songs when they had entertainment. She lived a long life and will be missed.. my deepest sympathy. I always enjoyed your Mom and Dad. So kind and generous and a great sense of humor! Stella brought my dad (Roly) treats after my mom went into the nursing home. God bless you all! Sympathy to the family. Such a gem Stella was and a life well lived. Sympathies to your family … She will always be with you.